Do You Enjoy Birding?? We Carry all your Birding Supplies. Stop by Benson’s for birding supplies. We carry everything you need from seed to feeders to bird baths and more! 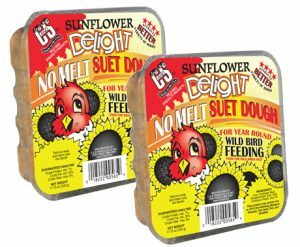 Sunflower Delight Suet Reg. $1.79 ea. and Feeders of All Kinds! Combine a wicked sense of humor with Yankee ingenuity and what do you get? 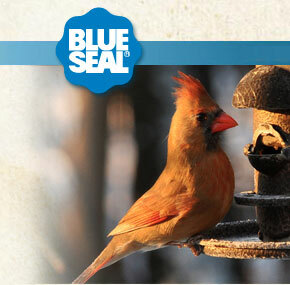 “The World’s Best Bird Feeders,” that’s what! 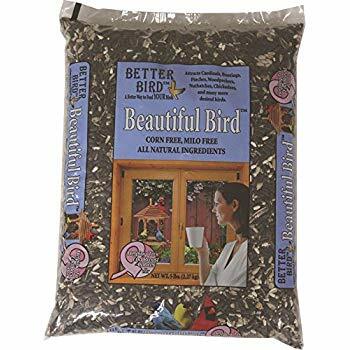 With a large variety of bird feeder styles to choose from, Droll Yankees bird feeders are very easy to fill and clean, and generations of bird lovers have appreciated their quality construction, functional simplicity, and commitment to American workers. It is rare nowadays to find a company that stands behind its product, but Droll Yankees offers a Lifetime Warranty and will replace any defective or squirrel-damaged parts, free of charge. 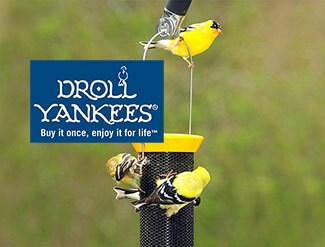 Many Droll Yankees customers have used their feeders for over 30 years! The Nuttery was founded by Leslie Lipton in 1990. An architectural designer by trade, Leslie had just watched the BBC’s Daylight Robbery which showed how squirrels can overcome obstacles to reach food left out for the birds. He set out to design a bird feeder that would baffle even the brainiest squirrel…..and so The Nuttery was born! Over 20 years later, the first feeder, the Original is as popular as ever with sales exceeding 1 million worldwide. Superior quality, innovation and design without compromise. Bird feeding, The Nuttery way. Settling for the cheaper feeder can be frustrating as you will most likely end up replacing it. Bird feeding is not just a hobby, it’s a long-term investment. Plus, bird feeders need to be able to endure freezing temperatures, sun and rain, and numerous backyard pests, including squirrels, raccoons and chipmunks. The best bet is to spend a bit more upfront for a feeder made with quality materials and backed by a product guarantee like those from Perky-Pet®, Droll Yankee, The Nuttery and others. This is where convenience is helpful. Having a big feeder that can hold plenty of seed means fewer trips to refill it. Birds typically eat about half their weight in seeds per day. Upgrading to a feeder that holds 2 lb of seed or more can mean that you feed more birds over a longer period of time. 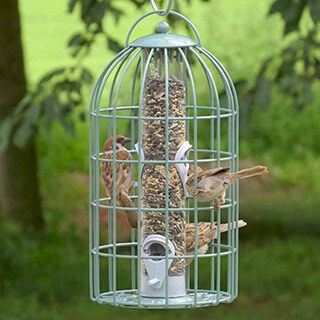 Try not to choose feeders with sharp edges or points; the design should allow birds to perch away from the food, which stops it from becoming soiled, but still allows easy access to the seed. Setting up more than one feeder and allowing ample space between them can also avoid fights between the birds. Don’t let nature “run its course” when it comes to bird feeding. If you do, squirrels will become bullies to your birds. This not only limits bird watching and bird feeding time, but squirrels can actually destroy feeders, too. Instead, try using a squirrel-resistant feeders available from Perky-Pet®, Droll Yankee or the Nuttery. Also, avoid tray feeders that pose an open invitation for squirrels and chipmunks. Other ways to keep sneaky squirrels off bird feeders is by pole-mounting the feeder, adding a baffle and choosing a better location that makes it difficult for squirrels to access. Birds are great to watch, but they can also be more than a bit messy. Birdseed can drop to the ground and the feeder itself can get grungy. In some cases, bird feeders can even transmit a disease from one bird to another. With that in mind, consider the cleaning procedures that may be required for particular bird feeders. In general, feeders should be cleaned about once every two weeks through the winter, so having a feeder that breaks down quickly for cleaning is a must. Of course there are other helpful considerations about feeding birds, including the seed to be used, the time of year and the birds present in a particular region. These five tips, however, cover the basics of any bird lover. With these tips in mind, you have the basic knowledge to make the best choice for a bird feeder purchase. The diets of wild birds vary based on the preferences of each type. 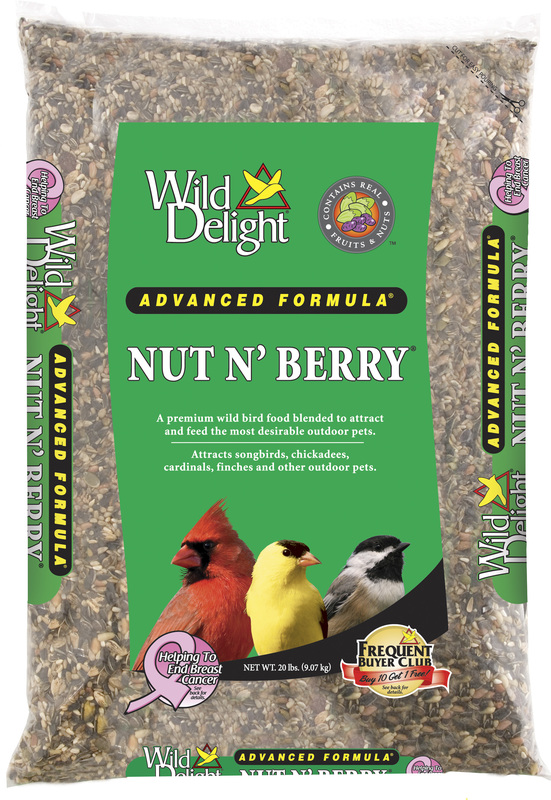 To attract an interesting array of birds all year ’round, Blue Seal offers a selection of specialty mixes as well as an extensive line up of premium products formulated to attract a broad variety of feathered visitors. Only the highest quality seeds, grains, nuts, and fruits are used in our mixes. Choose the ones that are right for you, your ecosystem, and your local bird population. 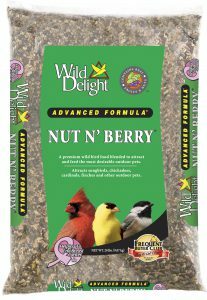 Browse Our Large Selection of Wild Delight bird food mixes! 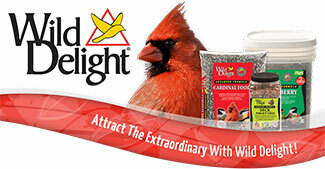 Whatever birds you have at your feeders or want to attract to them, we have a seed mix to fit your needs! !